After eight years working for Landmark in Western Victoria followed by twelve years with Tru-Test in Northern Victoria, Chris has joined Practical Systems in the role of the Sales and Marketing Manager for South East Australia.Chris, his wife Jo, and their three children live in Echuca, Victoria. Vernon van Duijnhoven started with Practical Systems in March 2001 and has in that time been involved in the development of all of Practical Systems software products. Vernon has been developing software for over 25 years and has previously been in software engineering roles in the laboratory automation and radio telemetry systems fields. His role covers all aspects of the software development from the initial product design, right through to product release and ongoing maintenance and support. He enjoys the diversity and challenges that working for a small software company provides. Rob grew up on mixed family farm at Coolah. After it was sold in 1980, he managed properties for a few years and then set up a Livestock contracting business, Coolah Stock Services in 1985, specialising in footrot eradication. 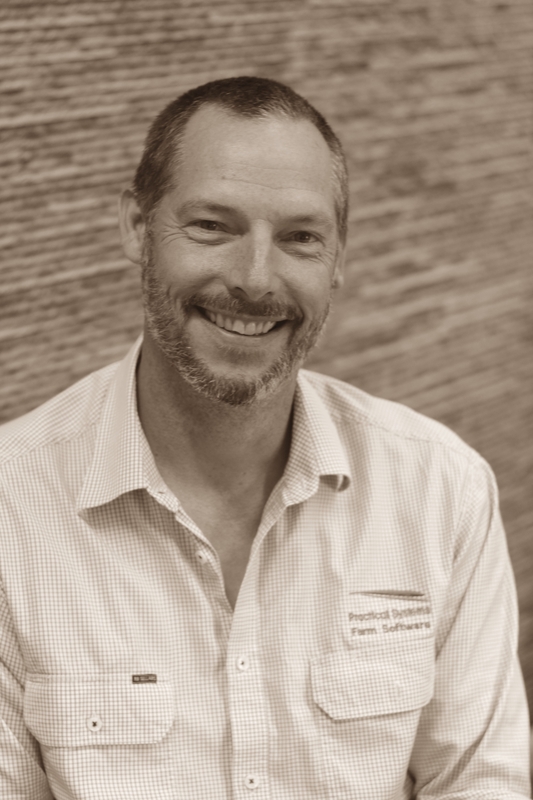 Rob moved to Hamilton, Victoria in 1996 to promote the use of a footrot product called Radicate in Victoria, NSW and Tasmania. Rob moved to Armidale in 2001 when there was a major footrot outbreak in the New England. Rob was contracted to AWI to develop an alternative to mulesing from 2004 to 2009. In 2010 he started data management for Stockbook clients and in November 2014 started work as a Stockbook consultant for Practical Systems. Sean began working at Practical Systems in 2008 as a full time member of the Support Team. After living in Queenland for a year in 2012, Sean returned to Practical Systems working in the role of programming and software development. Julie is responsible for maintaining the company’s financial administration. Julie and her husband Trevor owned and managed the local supermarket and liquor store in Uralla for 19 years. Julie is actively involved with the Uralla community and more specifically with Youth Ministry and has done so for many years. Julie and Trevor have five children and eight grandchildren yet she still finds time to attend art classes. Liz started with Practical Systems in May 2017. Liz has an affinity with Agriculture and the country which emanates from a long family history within the Agricultural Industry, more specifically from the Beef Cattle sector. In her down time, Liz enjoys riding her horses, going to regional social events and travel. Katelyn grew up in Armidale and has been a local her whole life. She joined the Practical Systems team as a Full-time Receptionist with a passion for Office Administration in September 2017. In 2015, Katelyn graduated Year 12 at Duval High School. After graduating she continued to study, gaining knowledge in a wide range of different areas such as Hospitality, Beauty Therapy and Retail Services whilst working Part-time at a local Supermarket. Outside of work, Katelyn has a passion for cars and animals (having 6 fur babies at home). Katelyn is excited to further her career at Practical Systems. Lauren joined Practical Systems at the beginning of 2018. She grew up in Uralla and moved to Sydney when she finished school to do a year of volunteer work. Lauren spent the next 10 years in Sydney doing accounts receivable work for multiple large companies. Lauren and her husband decided to move back to the New England area in 2017 to raise their young family. When Lauren is not working, she is enjoying family life and renovating their house. Leah has a passion for design. It’s a passion that she honed since completing her studies in 2002, and working in London and Brisbane on brands such as Sony, Ubet and the Lott. She has spent the last years transitioning from the traditional Designer to User Interface Designer. A real stickler for accuracy and efficiency, Leah is just the kind of fusspot you want overseeing your Product Design. Her work ranges from defining visual design to mapping out meaningful, user centred experiences for people to enjoy. She plans on studying User Experience Design further in the future. When she’s is not adding her creative flair to design engagement or renovating her house, you can find her at home with her hubby and dog, drinking a glass of red. Luke joined the team in March 2014 and whilst now trained in technology, he grew up in a rural setting and has experience working with dairy cattle. Previous to this new role Luke ran his own web development business and brings these online skills to new projects at Practical Systems. Tony started developing computer software professionally in 1990, firstly in the cotton industry, then later moved to Sydney to specialise in web-based systems. He has developed systems across a broad range of technologies and industries - from news outlets, to banks, accountancy software to explosives, and even gaming machine licensing. He led the team that built the first online mobile phone sales system, and has also built mobile phone apps that are in the Play Store and the App Store. After leaving Sydney he joined Practical Systems in 2015 bringing his skills and experience with him.